That famous portrait of the girl from Les Misérables beamed onto the screen, as the audience took their seats, but this time she was cleverly sporting a school uniform. A subtle green gobo filled the auditorium with atmosphere before the show began. The smoke and blue lighting at the beginning, as the steps turned, set the tone for what would be a very well-staged, dramatic evening, filled with super performances from all. An instant standing ovation erupted from the audience at the end of Ballywillan Drama Group’s production of Les Misérables and well deserved it was. As producer, Brian Logan was responsible for so many aspects of this show (direction, set and lighting design) and produced a high-quality version; a show that was well-measured, epic at times, simple in parts, all placed within a well-lit atmospheric setting. The orchestra was on a level on stage-left; visible and therefore adding to the whole musical experience, without ever getting in the way or overpowering the performers, thanks to Musical Director Eric Boyd ensuring that the band played at the perfect volume, well-supported by Darren Gardiner on sound. Ensuring that the actors did more than just sing, they were enabled to mix emotive acting with their impressive vocals. We were greeted by three separate set-pieces that blended beautifully into the stage; wooden structures with lop-sided laths of wood that had great energy in their construction while being wonderful asymmetrical, some small pieces of lonely torn fabric hanging off. The versatile steps structure enabled so many different moments of staging and different framings of space. The screen in the middle of the back wall that would be used to clarify times and places, something this work needs. Musical Director Eric Boyd, assisted by Andrew Robinson, ensured that solo lines from all of the prisoners in the opening scene were clear and well-delivered, as were those from the labourers who refused to employ our hero. The suffering of the men in prison was very clearly acted by this group of convicts. Jean Valjean and Javert’s timing in the opening sequence was very impressive and they had clearly been well tutored. There was a dramatic spotlight use on Jean Valjean after his release from prison. The silverware on the Bishop’s table really looked the part, thanks to a great job on props by Karen Hunter. The Bishop of Digne had a lovely voice and was able to capture the essence of a more aged man. The all-female ‘At the End of The Day’ was acted with superb conviction, as they sold the desperation of their situation. The factory girls’ harmonies were excellent. That nasty one in the factory who snapped Fantine’s letter out of her hand was very good. The Foreman was suitably hateful also. The blue wash and the white special on Fantine was lovely in ‘I Dreamed a Dream’, growing slightly warmer when she sang about the summer. Her death scene only contained the colours black and white, capturing the sombre mood of the moment. The celestial white light that shone on her dead body was powerful. The appearance of a star-cloth on the word ‘There” at the top of ‘Stars’ was really cool. The way in which Javert fell backwards off the upper level when ending his own life, followed by a dramatic blackout, was an impactful piece of staging. The boys belted out ‘Red and Black’. The pick-pocketing in ‘Master of the House’ was excellently done and the chorus really knew their stuff here. The Thénardiers with their bread baby (and the silverware falling out of her dress in the wedding scene later) was a hoot. The bricked pillars and gates that were brought on for ‘A Heart Full of Love’ were perfect. The classic stepping back and forth on ‘One Day More’ worked very well as they sported the iconic red flag. The blue and red lighting in ‘One Day More’ enhanced the idea of national pride, and the way in which the lights shone out into the audience was a great way to finish this dramatic finale of Act One. 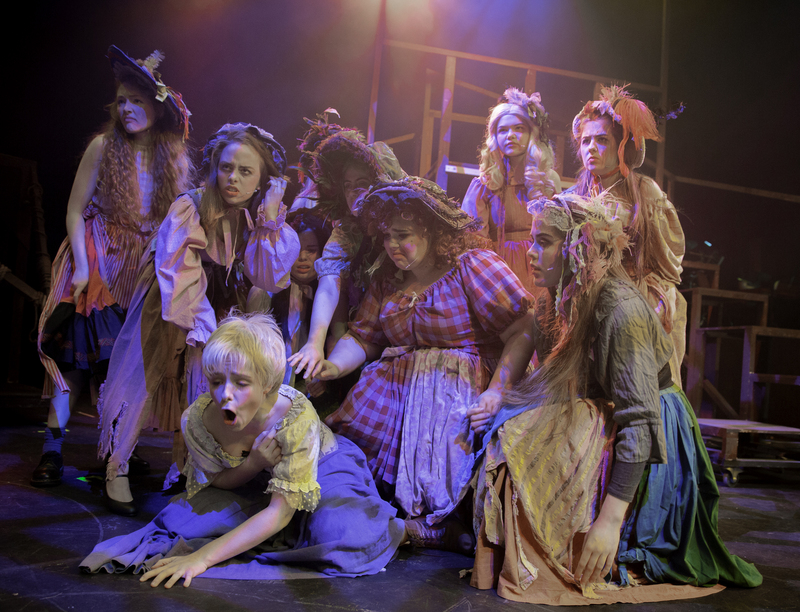 It was great the way the steps moved as Eponine used it to perform ‘On my Own’. The three seemingly separate structures would all eventually revolve and join up to become one long awesome barricade. The girls’ echoing on the “to you” and their lovely ‘aaaah” backing vocals in ‘Drink with Me’ were lovely, bringing a fresh flavour to the number that I had not heard before. The mix of dramatic fighting, slow-motion sequences and freezes all worked very well in this sequence. The red and blue movers in the battle scene added drama and energy to this moment. A bit more shoulder action was needed in the shooting scenes in the barricades. The firing of those old-fashioned guns looked a little too easy. I might argue that there were a couple of staging moments in the barricades that could have been re-worked e.g. the pretend killing of Javert did not have a sense of privacy to it; it looked as though Jean Valjean was shooting the gun as part of the greater crowd and perhaps this could have been brought to the side. Enjolras’ speech was up quite high on the barricade also and this suggested to me that he would have been an open target in this moment. The gunshot sound-effects were awesome. as was the dripping effect in the sewers. There was a really cool entrance created for the sewer scenes. The echo on the voices here nicely suggested a sense of space. The use of follow spots throughout brought excellent clarity to proceedings, drawing the eye and giving drama to intimate moments (I might argue that one or two of them were a little tardy coming in, however). They worked excellently well in ‘Drink with Me’ when there were a lot of people on stage and little movement possible to draw the eye to who was taking the lead. 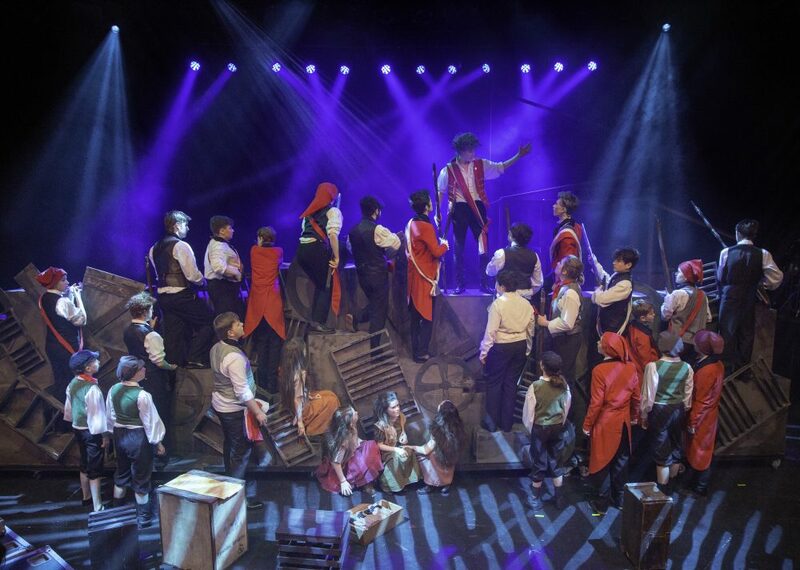 Stage Manager David Wray’s crew moving the barricades with the dead bodies still strewn across them, drenched in blue light, a spotlight revealing that Enjolras was actually killed, was striking. The lads coming back on in an eerie light during ‘Empty Chairs at Empty Tables’ was emotive, causing sniffling throughout much of the audience. The waltzing in the wedding scene, devised by Choreographer Sharon Logan, was very well executed; there were two groups on stage here, one doing a couples’ dance on one side and another circling in a group on the other, adding nice variety to the scene. The dancer who Thénardier referred to as “queer” owned the stage during this moment, and with the whole crowd circling the Thénardier’s in the end, the audience thoroughly enjoyed the whole number. The final note of the show was powerfully sung and, coupled with a blinding lighting effect at the end, caused the audience to jump out of their seats to give an instant standing ovation. ‘Lovely Ladies’ gave a different flavour. Older Cosette wore the same dress in a bigger size, effectively achieving a sense of continuity here. Everyone in the barricade scene wore red, white and black, which was really effective. The gowns and tuxes for the wedding scene were gorgeous. Hair and Wig design was by Choreographer Sharon Logan, with make-up supervised by Chloe Freeman. Jean Valjean had a series of wigs to chart his story; the first was scraggy, supporting the idea of the horrible conditions in prison, to a shinier slicker do to show how far he had come, and a greyer one by the time Cosette was all grown up. The aging/sickly make-up on Jean Valjean in his final moments, those dark circles under his eyes and whitened lips, was done very well. Fantine also had two wigs, one to show a gorgeous head of golden tresses and another pixy-style after she was forced to sell her hair. Enjolras ensured he had the right look for the piece by sporting a wig also. The final appearance by the Thenardiers, both sporting comic white faces and painted on rosy cheeks, he in his white peruke and her with a head of red curls and ringlets, was hilarious. Ross McAlister was excellent as Jean Valjean. He was nicely dramatic in his ‘Soliloquy’, ensuring that we understood his plight and intentions, and we began to care about his story. He captured all of the warmth he felt towards Fantine and the protectiveness of his ward Cosette. ‘Bring Him Home’ was emotive and beautifully sung. His final scenes, in which he was taken into heaven by Fantine, were moving. This is a mammoth role, one that requires an actor to chart so many emotions and have a singing range to match. Ross delivered very well on all scores and should be very proud of himself for conquering such an iconic role at such a young age. Patrick Connor was really good as Javert. He was authoritative, stoic and firmly fixed on his black and white interpretation of the law. Every “villain” is the hero of their own story and it was obvious that Patrick understood that Javert is not a bad person, just very intense in his views on right and wrong and his role to do what he thinks is God’s work. He and Valjean both knew the opening sequence very well and their timing was great here. His rendition of ‘Stars’ was very good, kneeling to pray during the instrumental. He was very emotional in the barricades as Jean Valjean released him and his suicide was tastefully performed. Very well done indeed. Jasmine Gardiner was awesome as Eponine, giving us an outwardly tough but secretly very vulnerable character. In so many ways she is the hero of the piece, selflessly ensuring Marius’ happiness, to her own detriment and tragedy. Her partnership with him was gorgeous and we could not help but wish that things had been different between the two of them. Her ‘On My Own’ was brilliantly performed and the song ‘A Little Fall of Rain’ in which she dies was excellently measured; not too over-the-top, mixing the performance of the beautiful score while the life force leaves her body. This was a star-turn. Elena Sheppard was also superb as Fantine. She is a great actress, not afraid to be a little sassy in the factory, attempting to stand up for herself against those bullying her. Her ‘I Dreamed a Dream’ was impactful, as she effectively moved from soft to loud. It was clear how broken her character was, having been working as a prostitute, and she acted the desperation she felt about her child very well indeed. The woman next to me was bawling her eyes out during the death scene. She looked so happy and content when she returned as a spirit at the end, showing how her face lit up with a warm smile, an emotion we had not gotten to see before in her tragic short life. Carly Weir showed us a lovely sweet voice as Cosette, displaying gorgeous soprano notes coming towards the end of Act One. She too was adorable in her partnership with Marius. (This Marius is a lucky guy having two girls love him!) She captured all of the poise and grace required for the role as a girl who had been brought up in a setting far more fortunate than the other ladies in the show. Her love for the two men in her life was convincing. She ensured that we were saddened when her Father died, while being happy for her that she got to learn the truth, say goodbye and still be with Marius. Jon-Lee Walker was very good as the rebellious student Marius, with clear vocals and a great ability to mix acting with singing. He captured all of the passion the young man felt about his role in improving society. His ‘Empty Chairs at Empty Tables’ was emotive, as he broken-heartedly recounted the loss of his friends, acting through song effectively. His respect for Jean Valjean, his love for the two females in his life, and his desire to put everything to right at the end was very clear. Ewan Williams and Lucy McDowell as the scene-stealing Thénardiers were hilarious as they tried to get as much money as they could out of Jean Valjean (and also as they entered the wedding scene). Their highlight moment – ‘Master of the House’ – was excellently performed; as they expertly picked those pockets and negotiated the meat-grinder etc., teasing all the comedy out of the number. They captured the ugliness of the characters, as they mistreated both the young ladies in the show, stealing from anyone they could, while never getting anywhere in life. Fantastic performances from both actors here. Seamus Donaghy was very good as Enjolras, invoking the passionate determination of this student to right the wrongs in his society. He was an excellent leader of the pack and manged all of the vocal demands of this part with competence. We were heartbroken when the barricade turned to reveal his corpse. Very well done. Poppy Mairs was adorable as Little Cosette, playing her part very well indeed. She made sure that we felt really sorry for her, showing off the Thenardier’s for who they really are. She sang so sweetly in ‘Castle on a Cloud’. Mathew Kirkpatrick had an excellent cockney accent as Gavroche. He had portrayed all the toughness and courage wrapped up in this little guy, his brave risk-taking proving to be his tragic downfall. His solo moments in ‘Look Down’ were excellent. He had such presence in the role and the West End production would be lucky to have him. Each moment the ensemble had to belt out their rousing choral pieces, they did so in style. Couple this with excellent principal performances, nicely devised staging and an inventive set and it made for a quality evening at the theatre. All those involved should be very proud of what they have achieved. While we were moved, miserable we most certainly were not.